The late Middle Ages was a time of intense religious ferment in Europe marked by countless calls for reform of the Church. Within monastic orders, the Observant movement was one such effort to reform religious houses, sparked by the widespread fear that these houses had strayed too far from their original calling. In Convent Chronicles, Anne Winston-Allen offers a rare inside look at the Observant reform movement from the women's point of view. Although we know a great deal about the men who inhabited Observant religious houses, we know very little about their female counterparts--even though women outnumbered men in many places. Often what we do know about women comes to us through the filter of men's accounts. Recovering long-overlooked writings by women in the fifteenth and early sixteenth centuries, Winston-Allen surveys the extraordinary literary and scribal activities in German- and Dutch-speaking religious communities in Italy, Switzerland, Germany, and the Low Countries. While previous studies have relied on records left by male activists, these women's narratives offer an alternative perspective that challenges traditional views of women's role and agency. Women were, in fact, active participants in the religious conversations that dominated the day. With its rich depiction of women as transmitters of culture, Convent Chronicles will be invaluable to scholars as well as to graduate and undergraduate students interested in the history of women's monasticism and religious writing. "Anne Winston-Allen breaks new ground in Convent Chronicles, studying texts that are all but unknown and challenging the notion that there were no, or too few, texts written by women in the Middle Ages. By exploring broad-ranging issues, she puts to rest the 'woman as victim' question. She shows that, quite to the contrary, women fought for what they believed in and actively resisted when their positions were challenged. Likewise, women were producers of important works that give us entirely new insights into female religiosity and its distinctiveness in the late Middle Ages." "This highly readable study deftly handles these difficult issues and suggests numerous avenues for further research. What is most interesting, however, is how clearly the women's voices surveyed in this work echo those of contemporaneous women writers across a wide geographic area (in particular those on the Italian peninsula)." "The perspective of this work is invaluable as an aid to exploring the history and writing of women during this time period." "This is a very exciting study, which draws on a large body of rarely explored primary sources written by nuns, and reconstructs their lives, and their role in monastic reform." 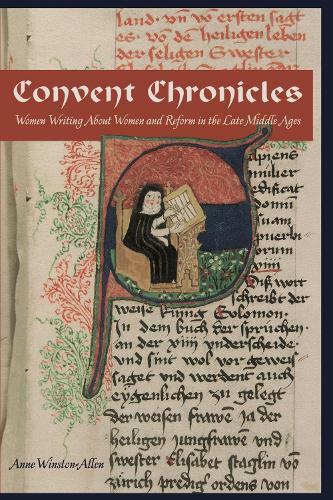 "Anne Winston-Allen sheds a bright light on such an era [of reform] in Convent Chronicles: Women Writing About Women and Reform in the Late Middle Ages. She takes the reader beyond the few well-known writers of a mostly earlier time, such as Hildegard of Bingen, to explore the writings of many women whose lives were influential in ways large and small." "Convent Chronicles focuses on the literary and textual production of fourteenth-, fifteenth-, and early sixteenth-century women's religious communities in Germany and the Low Countries. Winston-Allen does an excellent job bringing together the published material from these centuries and is thoroughly conversant with the growing secondary literature on women religious in the later Middle Ages, much of it in German and Dutch. Her study promises to be a significant one, providing a link between the recent work of Walter Simons, Gertrud Jaron Lewis, and others on Beguines in the Low Countries and the fourteenth-century German convent chronicles and Merry Weisner's work on convents during the Reformation and Counter Reformation. I can think of no other study in English that covers this material so amply or so well. It will be of use to scholars in the field, as well as to graduate and undergraduate students interested in exploring the history of women's monasticism and religious writing. I can easily imagine this becoming an important book for classroom use since there is littleif anything else available that deals with this particular moment in Christian women's monastic and religious history." "In this interesting, timely study, Winston-Allen (Southern Illinois Univ., Carbondale) sets out to demonstrate the significance of convent women's literary activities to the religious reforms under way in the period leading up to the Reformation. Focusing primarily on the 15th century and convents in German-speaking areas, the author examines such primary documents as sermon collections and summaries, personal letters, convent inventories, financial documents, and guidebooks, all of which were brought together within a loose chronicle format in convent anthologies, the 'sister books.' These texts, the author argues, indicate that women were major participants in the religious discourse of the later medieval period. She devotes six chapters to examining primary documents, paying particular attention to the Observant reforms that raise questions for scholars about the autonomy of women and the role of the convent in the social, financial, and spiritual lives of those entering and supporting them. Complementing two recent studies, Charlotte Woodford's Nuns as Historians in Early Modern Germany (2002) and Rebecca Garber's Feminine Figurae (2003), this thoughtful, informed treatment of an oft-neglected area has much to offer those interested in late medieval and early modern literature and culture." "This book is a treasure trove of information that has never before been gathered together in such a comprehensive fashion or with the particular focus on female agency and literary production. . . . With its extensive notes and bibliography, it is a fantastic resource and a must read for anyone working on or teaching the history or literature of this period." "In Convent Chronicles, Winston-Allen has written a masterfully engaging and important analysis. This book should be required reading for any scholars interested in female monasticism and women's literary production."